The professional card magic trick is designed for magicians of all levels who have a passion for card tricks or wish to expand on their repertoire of card magic that they perform in their show. Even if you have zero magic experience, this kit will turn you into an expert card magician in no time! 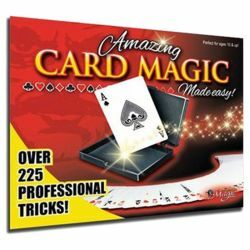 This kit includes two booklets, 125 Magic Tricks with a Regular Deck of Cards and 101 Card Tricks with Trick Cards. Also included is a universal deck (trick cards), a standard deck of playing cards, and a miracle card case.